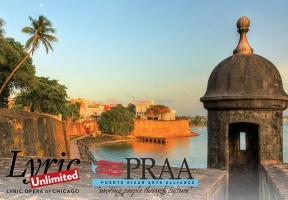 Lyric Unlimited in collaboration with the Puerto Rican Arts Alliance (PRAA), is excited to present Caribe Clásico, an evening of vocal and orchestral music dedicated to the classical sounds of zarzuelas, beloved Puerto Rican melodies, and popular Mexican boleros. The celebratory concert will take place on Saturday, May 19 at 7:30pm at Roberto Clemente Community Academy (1147 N. Western Avenue, Chicago). Tickets are just $20 for adults. Children (12 and under) and seniors (65+) receive free admission, but tickets must still be reserved at lyricopera.org/caribe. The event is part of Lyric’s ongoing Caminos a la ópera initiative, which expands Lyric’s commitment to Chicago’s Latino communities, and marks the first collaborative program with PRAA.